"I've been waiting eight years and one day for this!" "I'm ready. I've spent all year memorizing all the Articles of Faith. Ask me anything... except maybe number 10..."
"Let's see... Uncle Aaron will give the talk about baptism. He knows I love cars. He says baptism is like a car: you must keep it running smooth with obedience and repentance as we travel down the highway of life." "And Uncle Dan will give the talk on the Holy Ghost. He also knows I like cars. He says the Holy Ghost is like a stoplight: sometimes it gives you a green to go ahead and do the right thing; sometimes a yellow warning, and sometimes a big red STOP if there is danger or temptation nearby." "And my cousin...Isaac's sister...the one with the flute... All her family will sing my favorite primary song: A Child's Prayer. They play and sing so well that you can't help but feel the spirit." "Daddy did a great job Baptizing and Confirming me, but I accidentally put one foot too high up, so the witnesses said I got to go under again." "I look pretty handsome, right? I picked out this tie because it reminded me of BB-8 from the new Star Wars." "Mom dragged me to TWO stores to get this outfit! TWO STORES in ONE NIGHT! It was rough." "My family tree was well represented at my baptism. I had uncles, aunts, and cousins from both sides of the family, all my grandparents, plus a great aunt and uncle, a great-great aunt and uncle, and cousins once removed." "Thank you Uncle Weston for getting married so close to my baptism day! I think that's really what they were there for, but I got a bonus baptism benefit! "When Dan asked all my friends in attendance to stand, nine people stood..."
"...but when he asked all my relatives to stand, 51 people stood!" "And after the baptism, they all came to our house for pizza!" "Don't worry, Dad! 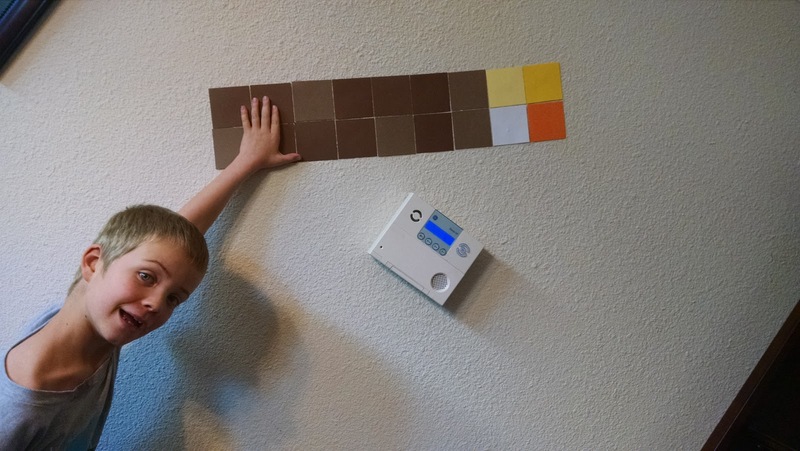 You're halfway done with baptizing your kids. The difficult ones are behind you." "All my friends and family that came wrote me letters or drew me a picture while I was getting dressed, kinda like this..."
"I've been preparing for this moment for eight years and one day. Now it's done. Now I'm preparing for my next important steps as I keep growing in the gospel!" Poor Larry has had very few proper birthday parties in his life, considering the busy time of year that his birthday falls... but this was a big year for him. Eight is great! 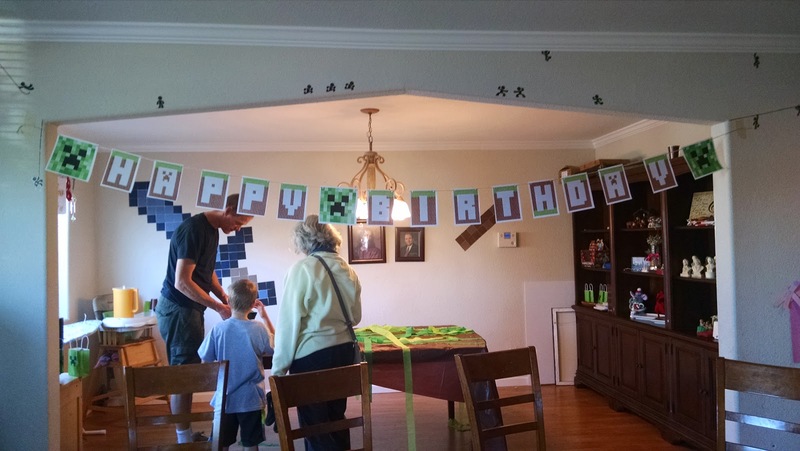 And along with his baptism, I actually made something of a themed birthday party for him. 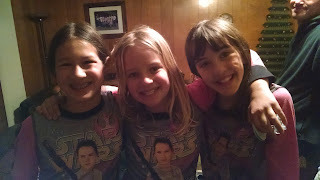 There was a lack of school friends in attendance, but an abundance of cousins from both sides of the family! 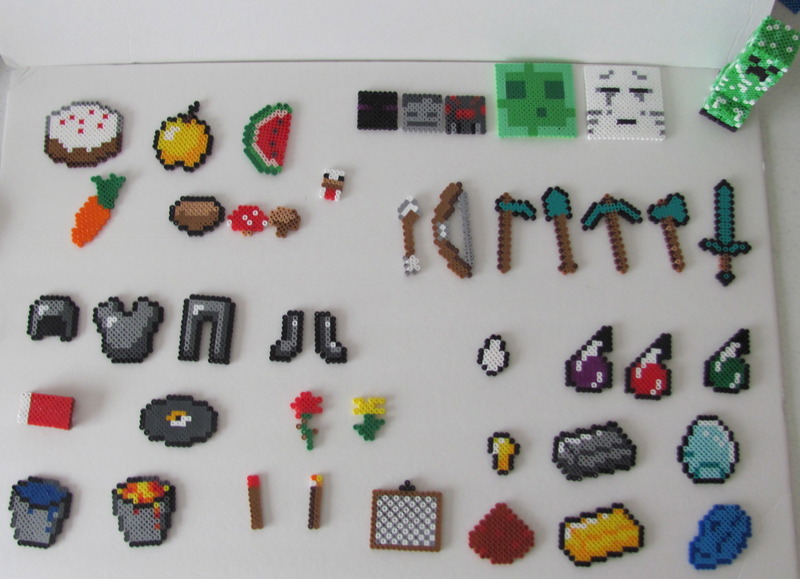 With each piece being a 3x3in. square, the whole sword measured about 4.5 feet long. If you're familiar with Minecraft, hopefully you recognize this torch... but most of my family that came wasn't familiar with the game. Most of them thought it was a cigar... whoops. 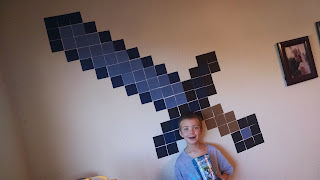 Of course I had aspirations to create several other "pixel art" style wall decorations, but alas, I ran out of time. For the "cake" Emily made rice crispy treats with Cocoa Crispies and then I cut them into cubes and topped them with green frosting to make grass cubes. 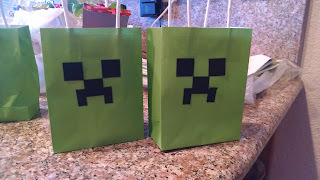 I tried to build a little block tower thing... but clearly I need more practice with Minecraft :) They were very tasty though! I also made Jell-o jiggler cubes in blue for water, red for lava, and green for grass. Lunch was a build your own sandwich bar. Creeper bowling! 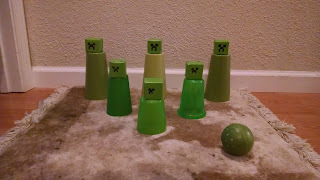 We wrapped up six blocks with green paper and drew the faces on them and since it was such a last minute event, we just used whatever green cups we had in the house and rolled a green ball down the hall towards them. Lots of fun! 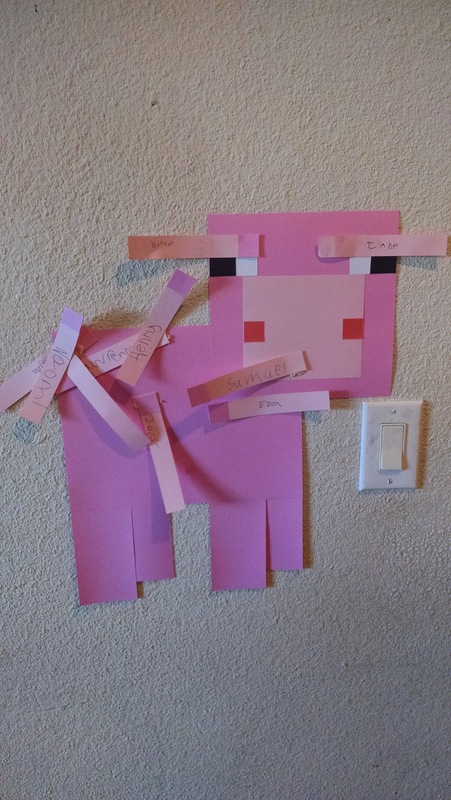 Pin the tail on the piggy. Classic game with a cubist twist! 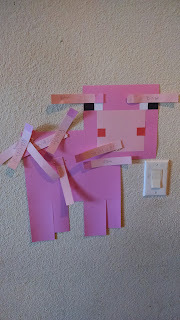 The thing I love most about the Minecraft theme is how easy it is to make anything from Minecraft... all you need is the right colors of paper and a chopper! At the end of the party, each kid got a crepper goodie bag with a minifigure. Yay! 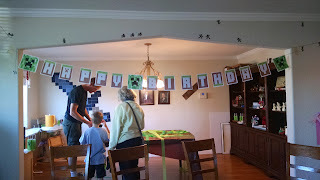 So that's the party of Minecraft, as celebrated the day after Christmas and Larry's 8th birthday! It's 2015... and that means a new Star Wars movie! 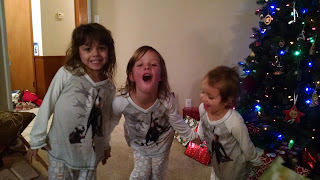 It's Christmas Eve... and that means new pajamas! Adele, Dawna, and Hannah in Pink Rey and BB-8 jammies. The whole crew! 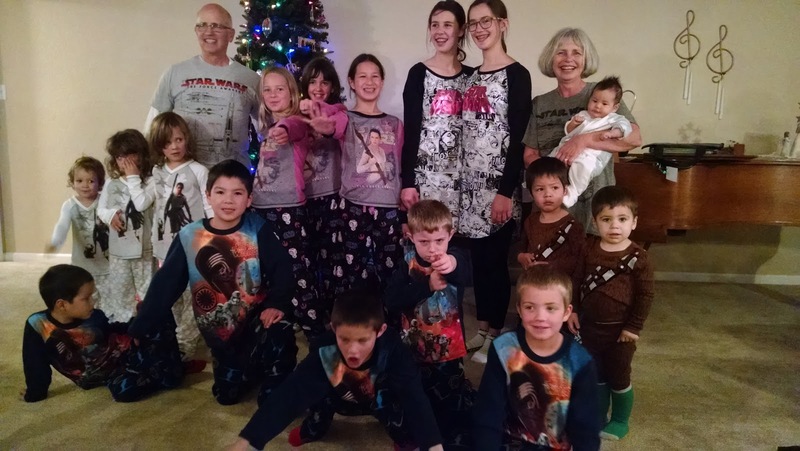 Aaron and Em, Heather and Rob, Paul and Becca, and Jon and Deeb kids... and what's that? Nana and Papa magically found Star Wars PJs mixed in with their grandkids! Everyone looks great! PS: Jon and I also got matching R2-D2 jammies. And yea, we did wear them to the movie!